Thanks for all who support Direct Hit on greenlight!!! Help us to get a Green Light at Steam community. Game available at Shiny loot. And soon be availabe at Desura (indie db). All disks replaced with new good ones. "New Disc" (ND Novyi Disk) company apologizes. All uneadable disk can be changed to new good disks at your local cd-shops. Today it became clear that all the CD are not readable. This is a marriage of the plant at stamping disks. We are very disappointed and we apologize. Hope our publisher fix this as soon as possible. CD release in Russia . Today we released game on CD in Russia. 2 years of negotiations with the ND (Noviy Disk) and 7 months of preparation for the press, finally reached its logical conclusion. Disk version have many changes (bugfixes), especially russian content. Game Version v.1.92. - Fixed research tree dependences. 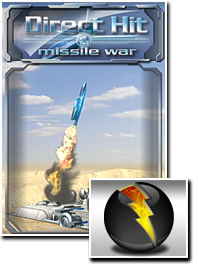 Today we released Direct Hit: Missile War patch 1.7. 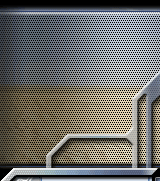 The main feature of this patch is the ability to save/load during a mission. 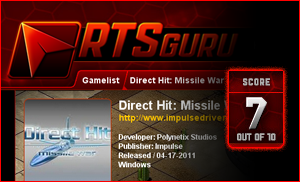 RTSGuru posted the first review of Direct Hit, giving it 7 out of 10, not bad! You can read the review by clicking on the picture below. Half a year has passed since the release of the game and we continue to release patches. We are currently preparing patch 1.7, which adds the long-awaited save/load option. We are planning to release this patch in first half of November. A more precise date can be found on forum. Keep track of the price of Direct Hit on game portals - Impulse and GamersGate, as we regularly run half price promotions. Direct Hit now available for purchase at Impulse Driven. 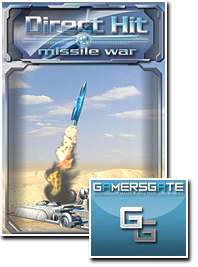 (Click on image below to visit Impulse and Gamer'sGate). 6 months have passed and we are almost ready to release Direct Hit. We are currently searching for a publisher. Five new screenshots are now available on the website, under the topic "screenshots". At present, we are working on the Single player campaign, which you can read about in the "Introduction" section. There is new entrance on site - welcome screen. Topics "Buildings", "Introduction", "Game features" are fully translated. Next targets – «Missiles» and «Tactics».